April 10, 2019 -Holyoke- The Office of Hampden District Attorney Anthony D. Gulluni announced today, members of the Massachusetts State Police Detective Unit assigned to the Hampden District Attorney’s Office, Massachusetts State Police, and Springfield Police Department, the Holyoke Police Department, the Department of Transitional Assistance in cooperation with the Hampden District Attorney’s Office, executed three search warrants into an EBT fraud case after a lengthy investigation. 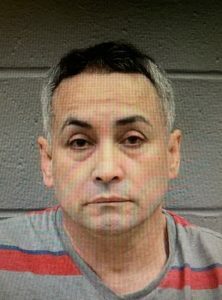 Jose A. Baez, 55 years old, of Holyoke was arrested today on charges of food stamp trafficking, access device fraud, larceny, procurement fraud, and money laundering in connection with a month’s long investigation into EBT fraud. Three search warrants were served, including one at El Rincon Boricua restaurant at 216 Lyman Street in Holyoke. The restaurant has also been shut down due to several code violations. Eighteen EBT cards have been seized as result of searches. The investigation has so far uncovered at least 50 violations of EBT fraud, totaling tens of thousands of dollars. Jose Baez is expected to be arraigned this afternoon in Springfield District Court.